Set in a fantastic location right in the heart of Churchdown village is this fantastically presented, deceptively spacious five bedroom detached house. Perfect for families and individually designed, this properties offers versatile accommodation throughout. Thoughtfully constructed and only built in the 1990's the property is incredibly spacious and offers a number of beautifully sized rooms. From the ground floor up, the property comprises of a kitchen breakfast room, utility, large dining room, living room, study, conservatory and cloakroom. Whilst on the first floor it offers a master bedroom with four piece ensuite, walk in wardrobe, three further bedrooms, one with ensuite, one with dressing room and a family bathroom. 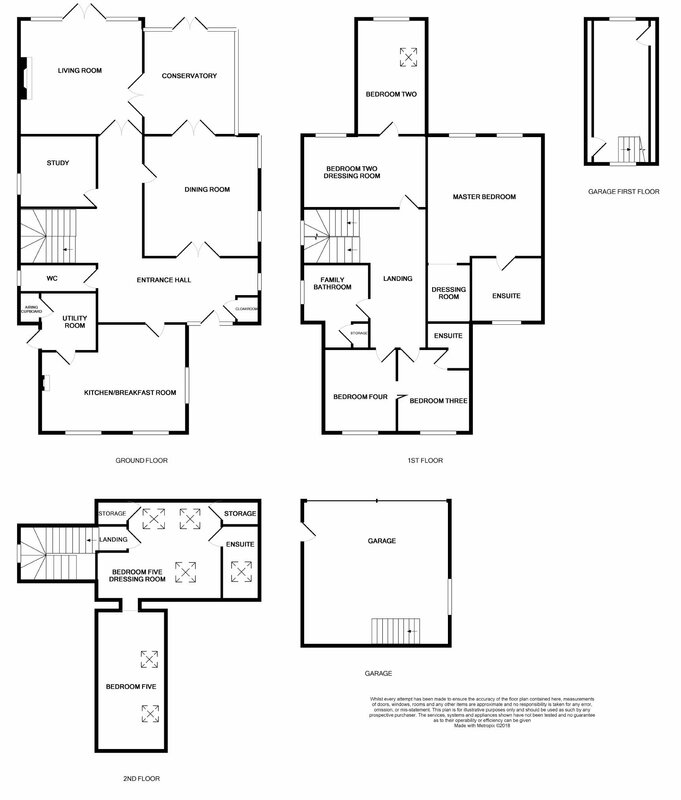 Lastly on the second floor it holds a further bedroom, ensuite and another extra space/dressing room. 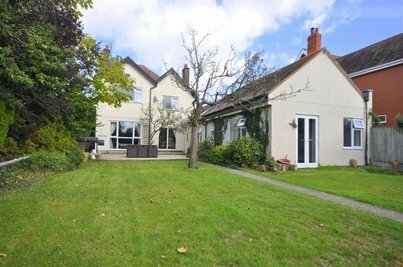 The property is completely multifunctional with the potential of converting in to a large 4 bed or separating rooms to create possibly up to 7 bedrooms! 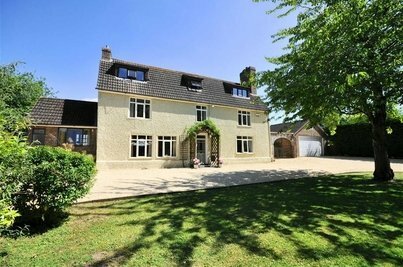 This property really is a must see to appreciate the size of accommodation on offer and how unique this is. Call 01452 545554 to book your viewing. Entrance via wooden glazed door with side panels. Wooden double glazed window to side aspect. Stairs to first floor. Doors to kitchen, dining room, living room, study and cloakroom. Built in storage cupboard. Built in storage under stairs. Radiator. Dado rail and coving to ceiling. Telephone point. Three wooden double glazed windows to front and side aspect. Doors to entrance hall and utility room. Feature fireplace with brick surround. Range of wall and base units with laminate roll top work surfaces over. Sink and drainer unit with mixer tap over. Ceramic tiled splash back. Integral electric oven, electric hob with built in extractor hood over. Integral dishwasher and fridge freezer. Laminate flooring. Radiator. Coving to ceiling. Spotlights. Television point. Wooden double glazed window to side aspect. Entrance via double doors or single door from entrance hall. French doors leading to conservatory. Radiator. Coving to ceiling. Wooden double glazed french doors leading to garden with two side panelled windows. Wooden glazed french doors leading to conservatory. Feature fireplace with stone surround. Radiator. Wall lights. Coving to ceiling. Television point. UPVC double glazed conservatory to rear and side aspect with dwarf brick surround. UPVC double glazed french doors leading to garden. Access to living room and dining room. Door leading to side access. Cupboard housing gas boiler and central whole house hoover system. Range of wall and base units with laminate roll top work surfaces over. Sink and drainer unit with mixer taps over. Ceramic tiled splash back. Plumbing for washing machine and tumble dryer. Wooden double glazed door to side aspect. Telephone point. Radiator. Coving to Ceiling. Wooden double glazed frosted window to side aspect. Low level W/C. Vanity wash hand basin with mixer tap over. Part ceramic tiled walls. Radiator. Wooden double glazed window to side aspect. Doors to bedrooms one, two, three, four and family bathroom. Stairs to second floor. Dado rail and coving to ceiling. Radiator. Two wooden double glazed windows to rear aspect. Door to en-suite, archway to dressing area. Radiator. Wall lights. Television point. Via archway from master bedroom. Two double wardrobes. Wooden double glazed frosted window to front aspect. Low level W/C. Vanity wash hand basin with built in storage unit surround. Corner shower tray unit fully enclosed with shower over. Part tiled walls. Panelled square bath surround with mixer taps over. Heated towel rail. Ceramic tiled flooring. Extractor Fan. Spotlights. Door to bedroom two. Wooden double glazed window to rear aspect. Radiator. (Potential to separate into further bedroom if required.) Television Point. Access via dressing area. Wooden circular double glazed window to rear aspect. Velux window to side aspect. Access to eaves storage. Wooden double glazed window to front aspect. Door to ensuite. Adjoining folding door to bedroom four. (Could be fully separated). Radiator. Low level W/C. Vanity wash hand basin with tiled splash back. Single shower tray fully enclosed with shower over. Wooden double glazed window to front aspect. Adjoining folding door to bedroom four. (Could be fully separated). Radiator. Wooden double glazed frosted window to side aspect. Low level W/C. Vanity wash hand basin with storage below. Single shower tray fully enclosed with shower over. Panelled bath with mixer taps over. Part tiled walls. Radiator. Door to bedroom five/dressing room. Velux window above staircase. Velux windows to front and rear aspect. Doors to ensuite and archway to bedroom five. Two cupboards with eves storage. Radiator. Television Point. Two velux windows to side aspects. Velux window to front aspect. Single shower tray fully enclosed with shower over. Vanity wash hand basin. Two single up and over doors. Personal door to side. Power and lighting. Staircase leading to fully boarded second floor and access to eves storage. Circular wooden glazed window to front. Block paved driveway to front with double detached garage enclosed by dwarf wall surround, shrub and flower boarders. Gated access to both sides of property. Outside light. Patio area leading to steps leading to further patio area and lawn area. Enclosed with well maintained hedging around and shrub boarders. Summer house to rear of garden with further patio area. Side access to both sides of property. Outside tap. RESIDENTIAL LETTINGS – AGENTS NOTE: Please note that additional fees from £300.00 will apply depending on the number of applicants. A calculation will be provided prior to payment of any holding fee. Further details can be found at www.thepropertycentres.co.uk/fees. Do you need a mortgage to purchase this property? Use our simple mortgage calculator to discover how much you could potentially borrow.